Noa and Nani High Sleeper. Solid Pine High Sleeper Cabin Bed in White or Blue or Silk Grey. Ladder and Desk can go either on the left or the right. Clearance to the underside of the bed 1365mm. The desk is not integral to the structure and can be removed if you require more room underneath the bed. High Sleeper Cabin Bed Frame in White or Blue or silk Grey. If you opt for a mattress we supply a 3ft Single Memory Foam Hypoallergenic Mattress. 190cm x90cm x14cm made of resilient high density foam and comes vacuum packed. Maximise space in your childrens bedroom with our versatile high sleeper, featuring a high single bed with a spacious corner desk underneath, as well as ample space for extra storage. Its the perfect workspace for your child, as well as super comfy for catching some Zzzs. 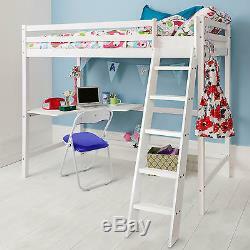 Or why not utilise the under bed space as a chill out zone for your hard working child theres plen. Ty of room for a small sofa! Want to add even more storage space underneath the bed? Then why not grab our 4 box shelving unit. It fits right on to the back of the High Sleeper, great for putting pictures in or storing Books and Toys. Add a futon underneath for an additional bed or add a Folding Chair in one of our funky colours. Probably the most important factor is Safety. All our beds conform to UK Safety Standards regarding EN747 bunk bed compliance and also all of our fabrics are fully compliant with UK Fire Retardant issues. We will not be beaten on price, find any item cheaper elsewhere let us know and we will beat it. If you live in an apartment block this may mean the item will be delivered to the main door. 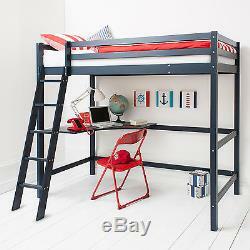 The item "High Sleeper Cabin Bed with Desk in Choice of Colours High Sleeper" is in sale since Monday, June 17, 2013. This item is in the category "Home, Furniture & DIY\Furniture\Beds & Mattresses\Bed Frames & Divan Bases". The seller is "northshore736" and is located in Kent.